» Why are the Solaire Grates V Shaped? » Can You Use Fans & Blowers To Get More Heat From Gas Log Sets? » Can You Convert a Gas Log Set from One Gas Type to Another? » Does cracking ever occur with Gas Logs or FireBalls? I'm not sure yet. I may want to purchase this grill at the end of the rental period, or I'll decide how to return it later. I'll contact Solaire at 562-696-8718 or info@rasmussen.biz at the end of the Demo Rental Period. "Try Before You Buy" Solaire Infrared Grill Demo Program. Will it grill any better than my old grill? Is it designed and constructed to last? Will it be worth the significant financial investment I will be making? We created the Solaire Infrared Gas Grill Demo Program and the Solaire AllAbout Infrared Gas Grill to specifically address these concerns so that you can make a more informed decision before purchasing your next gas grill. We designed the AllAbout to provide all of the construction details, durability, and performance of our larger grills in a package that we can ship to you via FedEx or UPS. This way, you can can experience and experiment with Solaire infrared in your own backyard and try the food it makes for yourself. We always say that if somebody just tries a steak cooked off one of our grills they'll get hooked, so this is your chance to taste it for yourself. Our experience is that you will be blown away by the tastiness and juiciness of the food you grill on a Solaire. See for yourself why the Solaire grill is one of the best infrared grills, if not the best infrared grill out there. You receive a fully functional grill, ready to attach to your propane tank or natural gas hose (whichever gas you specify). The AllAbout grill is designed to be set on a table or other firm surface. The demo period is for two full weekends and the week in between. The first weekend is for you to get your bearings, and the second weekend is for you to dazzle your family and friends. After the second weekend, you will wipe the grease from the grill and repack the grill into the carton. On Tuesday morning, you will set it on your front porch for UPS to pick it up (we will issue a call tag on Monday for a Tuesday pick up). Or, you can elect for us to provide you with a UPS label and you will drop off the packaged grill at your local UPS Store. Upon UPS picking up the grill, we will email you a certificate which will entitle you to a $47* discount on the purchase of any new Solaire infrared gas grill from our webstore here within 30 days. 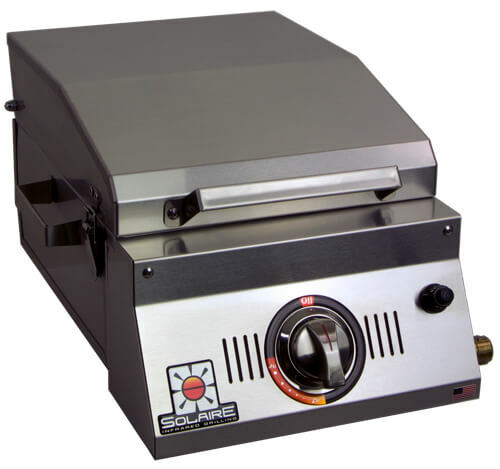 Hood Down: W = 15", L = 20", H = 11"
Hood Up: W = 15", L = 21 3/4", H = 22 7/8"
Clean grill, very well packaged. A great way to try before purchase. We plan to buy a different model, based on this trial. We weren't sure what to expect but now at the end of our trial we LOVE infrared grilling. We can't go back to conventional grilling. We have vegetarians and meat-eaters all under one roof; real meat, fake meat and vegetables all require different cook times. Veg-meat doesn't have any fats or oils so they dry out quickly, but not on the Solaire grill, the food is cooked before the moisture evaporates. AND BONUS, we get a wonderful char on our food now without drying it out. The grill arrived in a well packaged box. Construction is first rate. It appears to be a brand new grill. After cleaning and set up, we tried some 3/4 - 1" thick ribeyes (2). Grill was warmed up on high for 3 minutes. Steaks were close to room temperature, seasoned both sides with Cavenders spice mix. Per the guide, we grilled for 2-1/2 minutes each side. Internal temp was 145 deg. Rested for 10 minutes. I've been grilling for 25-30 years on Weber grills. I have to say that the steaks on this Solaire are tastier and juicier that any other home grilled steaks. I'm not saying these are comparable to Ruth's Chris but definitely the best I've ever done. And this was my first attempt. Click the button below to add the Solaire Demo Rental Program to your wish list.